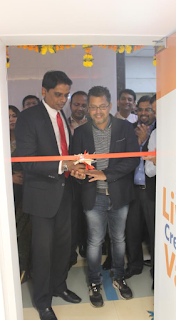 Mumbai, February 20th: IndiaFirst Life Insurance inaugurated its full service branch in Ghatkopar, Mumbai. Headquartered in Mumbai, IndiaFirst Life Insurance, with a paid-up share capital of INR 625 crore, is one of the country's youngest life insurance companies. It is promoted by two of India's largest public sector banks - Bank of Baroda and Andhra Bank along with UK's leading risk, wealth and investment company Legal & General. Bank of Baroda holds a 44 percent stake in IndiaFirst, while Andhra Bank and Legal & General hold a 30 percent and 26 percent stake respectively. IndiaFirst believes it can differentiate itself through simple, easy to understand products that are fairly priced and efficiently serviced. Today, IndiaFirst Life is present in over 1,000 cities and towns across the country through 10,000+ points of sale. The company garnered over INR 10,000 crore of assets under management as of 4th October, 2016.